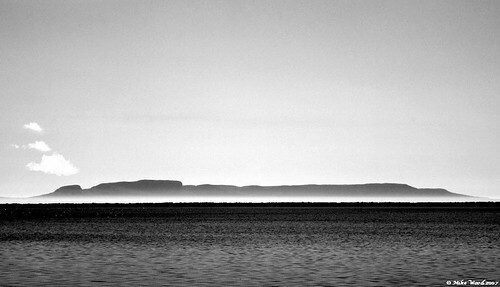 Before I left Thunder Bay, I shot some images down by the harbour the first one is The Sibley Peninsula, or the "Sleeping Giant" accross from Thunder Bay. It's a natural rock peninsula in the shape of a giant sleeping person (head on the left). The rock juts into Lake Superior and forms Thunder Bay. One Ojibway legend identifies the giant as Nanabijou, who turned to stone when the secret location of a rich silver mine, now known as Silver Islet, was disclosed to white men. when I shot it, the early morning mist was still low and made it like a cloud bed. Using the circular polarizer filter helped being out some contrast. I have started to use it a lot for the landscapes when it doesn't cut down on the light too much. 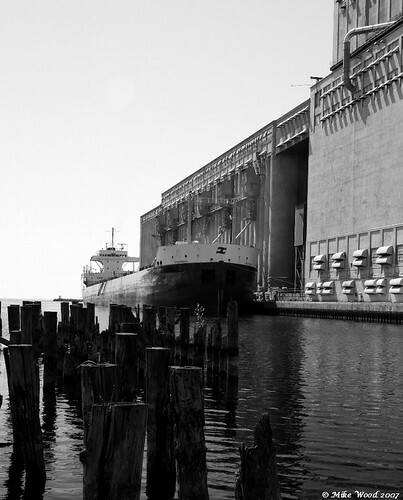 I also shot a couple of images down at the grain docks. I used to work at Harbourfront in Toronto back in the early 1990s. One of the facilities we were responsible for was the abandoned Canada Malting buildins at the foot of Bathurst St. This structure was much larger - as with its two other sisters which were not accessible to me. The ship is the 700 foot class Canada Steamship Lines vessel Cedarglen loading up with grain with some old wood piles (pier supports in the foreground). 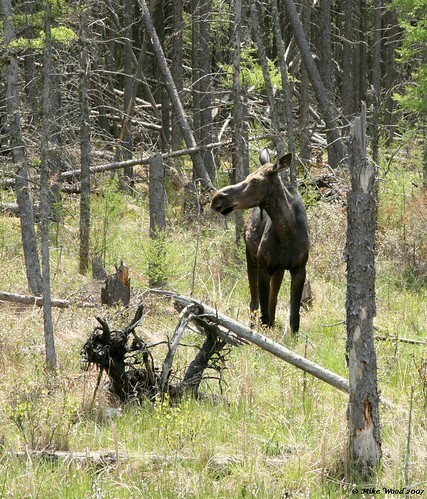 I finally shot my first ok moose pic today too near Firesteel River on the 17. I say OK, because most of my moose pics have been not too sharp. everything in the pic can be sharp, but not the animal itself. My theory is that the sheen of the hairs combined with a high ISO and low light at dusk. today was bright sunshine. close enough to hear it drinking and chewing the grass. no more than 25 feet at times. they are certainly curious creatures. like cows, but taller. Not sure on the comparable dumbness factor though. Drizzling started soon after the moose shot and continued all the way out of the province off n on. I wouldn't see sun again for a couple of days which was a bit of a dissapointment. I stopped over in Dryden where my friend Sarah was doing some tree planting. When I checked their base camp, the cook said they were still at least two or three hours out so i left a note for her - which I am sure melted under her car windshield wiper as it started to downpour. Some of the worst rain I have ever driven in. Not fun when you are being chased by an 18 wheeler on twisty turny roads that are so rain soaked that the occasional hydroplaning happens. 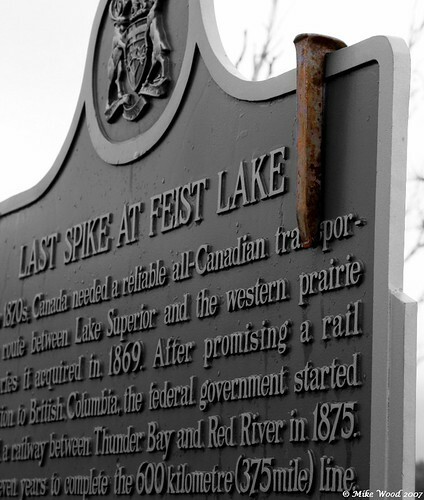 Near Kenora I came across a plaque for the last spike put in the rail line between the Great Lakes and the Prairies in 1882. When I saw the sign, I thought the rail spike on the right was intentional, but someone had just left it there loose hooked on the edge. I stopped for the last time in Ontario in Kenora which is just a heartbeat from the Manitoba border. I had a bite to eat at a somewhat ghetto Husky there (we are spoiled by the one on the 401 I have come to realize) and chatted with Mandy and sent a couple of emails from my phone. And to my credit, I have resisted shooting big giant things like nickels and geeze and so on, but for Louise I shot this Transformer inspired bug outside a metal recycler in Kenora. 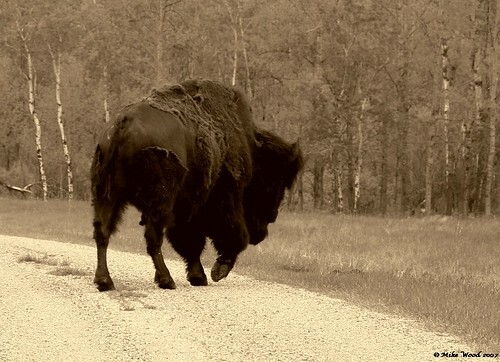 Once I crossed into Manitoba, it was a huge difference. Mainly roads became straight all of a sudden. and fairly flat so I decided to press on past Winnipeg. It took me two days of solid driving to get out of Ontario, and I drove 3/4 across Manitoba in a couple of hours. when I pulled into the Husky in Brandon, I had driven 1022km today. I napped for about three or four hours in a corner of the parking lot and got up at about at 445am. I had a specific plan. 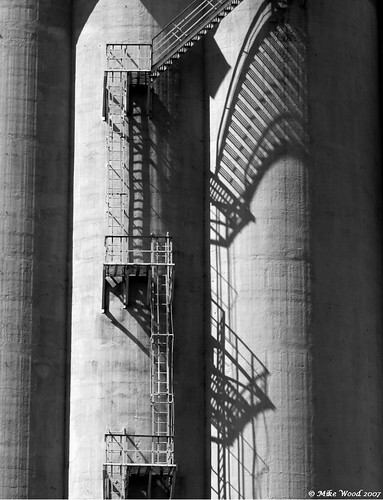 I wanted to shoot some grain elevators in Inglis which is Northwest of Brandon. Sounds boring I know, but the set of elevators beside an abandoned spur is the last set on the prairies. I thought some morning sunrise shots would be cool. I had determined they faced generally East so they were ideal for this. Unfortunately the weather continued to be overcast and my arrival at about 645am didn't mean any sun one way or the other. Made for somber dark feeling shots. Perhaps befitting these last remaining elevators? I then drove around some back country roads (think lots of gravel and slow going) with the the idea of going around the top of the Riding Mountain National Park. It's between Dauphin and Brandon and is bisected by a highway. 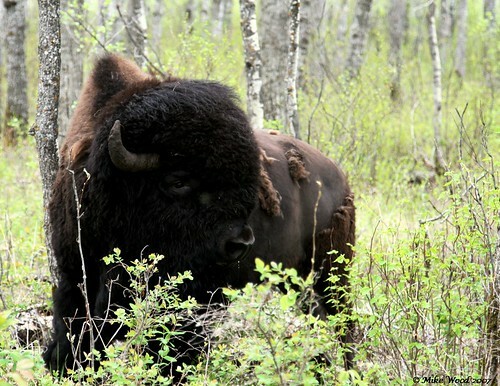 I had heard that there was a bison enclosure there and wanted to see if it was true. It is quite a haul to get to it, but worth it if you can go there. 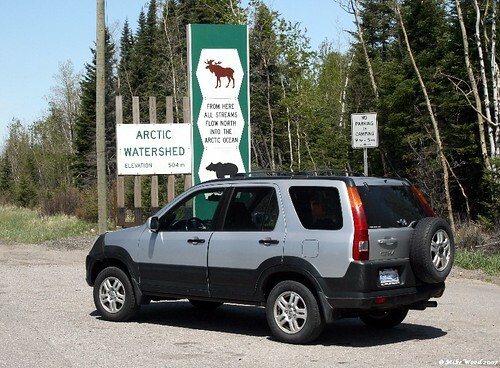 It is at the far end of Audy lake in the bottom end of the park and at the end of a 20km twisty semi gravel road. You drive into the vast enclosure (like African Lion Safari) which has not gates only those rolled steel tubes seen to keep cows in or out on farms. Apparently hoofed creatures hate em and wont cross. Enclosure has two routes a north one and a loop closer to the entrance. The north one was OK but not anything close enough to shoot. The South one panned out better. 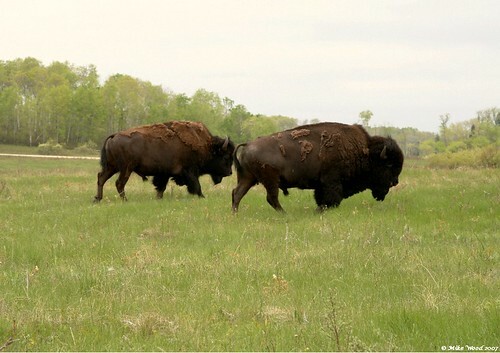 I got close enough to the plains buffalo that I could hear them breathing. Any closer and I would have smelled them. The last shot below was one where I got a little concerned. I had been following this one and two others for the better part of 25mins or so. Driving on the road and stopping and turning off the engine, shooting em, and then moving with em and stopping. When they entered some trees I followed. And then came parallel. and about 4 feet from this one. He (?) began to tilt his head back n forth rocking it. As I have no animal behavioural science skills I wasn't sure if this was threatening. what I did know was that if it decided to charge, its 600lbs would do more than dent the CRV. so I moved off! :) Super cool getting that close to something I had never seen before. As a side note, this was a National Park. signs say display valid park pass, etc. But it would help to actually see any park staff at either entrance. Nobody around. I would have paid for that. It was certainly worth the price of admission. what I would not have paid for was the little passengers I got when walking about the park area (that you were allowed to walk in... I never got out in the buffalo enclosure. ;) I found I had somewhere between 8 and 10 ticks. i know they like the animals, and when i was walking in some grass they hopped on board. Of course I only noticed this when driving. and I kept finding them for the next few hrs. 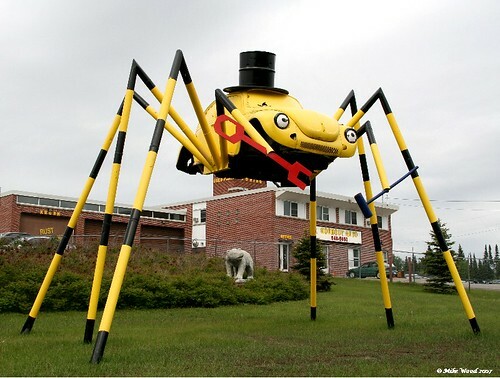 never got bitten by one, but they were certainly unwelcome! With the driving around the park and such the trip between Brandon MB and Regina Sask was 1006km. Would have been about 300 less without that. 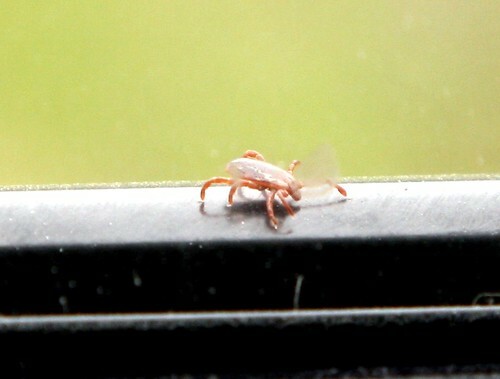 I slept well and tick free that nite. And then was Saskatchewan and the Rockies... More to follow.